Science Technology and Innovation in Public Governance (Sci-Tech @ FSPAC), is a 2 years English-language Master program. Science, Technology and Innovation in Public Governance MA is the international academic program focused on the use of technology in governance. It answers an increasing need for a fluent public and private government system that brings comfort in the life of citizens. It encourages a decision-making process based on reliable data, the result of research. It also gives students the opportunity to develop themselves as entrepreneurs for both public and private government. • TECHNOLOGY – Together with our partners from ITC industry we participate through the Applied Research Lab in the process of identification, research and development of ITC solutions for the act of governance in the public and private environments. • GOVERNANCE – We encourage our students to develop their inner drive and we support them to become successful entrepreneurs of their own future and of the future of our desired society. Their governance and managerial skills are developed under the guidance of our top-management partners from government and industry, from Romania and from around the world. 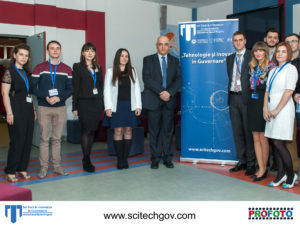 • INNOVATION – Science, Technology and Innovation in Public Governance MA is disruptive and innovative in itself, by the straight connection it makes between technology, government and innovation. Our team is constantly up to date with the latest trends and discoveries in all fields, with a focus on the solutions for better governance processes.. In the Applied Research Lab, our students are challenged to participate in projects that are preparing our society for the future. 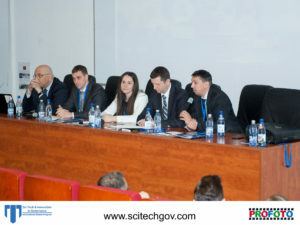 Read full article: Sci-Tech&Innovation in Governance; you can also read the Press Release for the 1st edition of the Sci-Tech&Innovation in Governance Conference.